The “inquiries” into CRU, as is well known, did not examine CRU’s “science”. One of CRU’s main “contributions” is the “proof” by Jones et al 1990 that the development of urban heat islands contributed no more than ~0.05 deg C to measured 20th century land temperatures. This proof is an integral component in justifying CRUTEM – which makes no allowance or adjustment for increasing UHI. Jones et al 2008 revisited this theme, estimating the UHI for London at 1 deg and New Yok City at 1.5 deg C, editorializing that much of this would have developed prior to the 20th century. Jones’ failure to allow for developing UHI has occasioned much skeptical criticism over the years. Jones and the Team have used their offices as reviewers to quash criticism from appearing in print e.g. “going to town” as a reviewer on papers that had the temerity to criticize and, as IPCC review authors, to initial suppress and then include only with adverse editorial comment criticisms like McKitrick and Michaels 2004. The recent McKitrick and Nierenberg 2010 is the most recent entry in this longstanding debate, replying to and rebutting Gavin Schmidt’s comment on McKitrick and Michaels 2007 – all of which direct UHI indirectly. The compact city of Providence, R.I., for example, has surface temperatures that are about 12.2 °C (21.9 °F) warmer than the surrounding countryside, while similarly-sized but spread-out Buffalo, N.Y., produces a heat island of only about 7.2 °C (12.9 °F), according to satellite data. Zhang has an interesting graphic showing the dependence of UHI on ecology – comparing Baltimore, Dallas and Las Vegas. She observes that UHI has a particularly large impact in forested areas, while the impact in desert areas is relatively negligible. Forest, around 10C, grass 5-6C, desert weak and sometime heat sink. In an accompanying presentation here, UHI in Paris is estimated at 8 deg C at night and up to 10 deg C in some suburbs in the afternoon. This entry was written by Stephen McIntyre, posted on Dec 15, 2010 at 5:19 AM, filed under Uncategorized and tagged uhi, zhang. Bookmark the permalink. Follow any comments here with the RSS feed for this post. Both comments and trackbacks are currently closed. Good follow-up post, Steve. I was going to link Anthony’s NASA post in your previous post about MN10, but you’ve gone ahead and done it. Mosher does some good teaching in the comments at WUWT. If size matters then it would be nice to see a plot of UHI versus city size (& compactness & ecology). I didn’t see that in the Zhang slide presentation. Nor any statistical analysis. Steve, end of your second paragraph should read detect not “direct”? It’s amazing this got past Hansen, unless Goddard Space Flight Center in MD and Goddard Inst. for Space Studies in NY are completely separate parts of NASA. In measuring the UHI, however, it is important to bear in mind that most cities are centered on rivers, so that their surrounding rural areas are generally of higher altitude. There is no mention of altitude in the NASA GSFC webpage at http://www.nasa.gov/topics/earth/features/heat-island-sprawl.html. I have no doubt that a substantial UHI exists even after altitude is corrected for, but it might be a little smaller than reported. I’ve been thinking the same thing about Hansen’s influence within NASA. Limited. Well worth knowing. GISS employs 61 staff and contractors. NASA employs 68,000. Although Ping Zhang’s presentation at http://www.nasa.gov/pdf/505254main_zhang.pdf has a slide showing altitudes across the US, there is no mention on the slides that altitude has been adjusted for in computing the UHI estimates. They do not estimate the impact of altitude. They take altitude out of the analysis by cutting out all areas 50m above and below the mean altitude of the city. Holding altitude essentially constant would eliminate the need to adjust for altitude differences, but also means giving up a lot of data, particularly when the city is surrounded by higher ground. The 2C/1000′ lapse rate assumption cited by smcg below, used by the Int’l Civil Aviation Assn according to http://en.wikipedia.org/wiki/Lapse_rate, would allow a lot more of the data to be used. But maybe they have enough as it is. I once was a student pilot. The lapse rate, strictly speaking, applies to elevation above ground level (which is strongly affected by local atmospheric conditions such as absolute humidity and the rate of change of the absolute humidity in space and time) and this should be considered when making certain kinds of comparisons. One probably should use a density altitude instead, since we are dealing with near ground measurements even when the local ground is 1000m above sea level, for instance. Bender, sorry I missed your post. Hu, the rural ring has radius ~50km, but I didn’t find any mention of how much data was discarded. True i would think, but at least some of the cities cited are also relatively flat (eg. Paris). 2deg C/1000′ for environmental lapse rate might reduce, but not eliminate, a bit of this effect, but I suspect not that much in general? Some of the reports are seasonal numbers as well. Lynchburg does not have a population of 7000. That’s off by an order of magnitude. Perhaps a zero is missing, or maybe they meant Lynchburg, TN? I don’t know where in the world they got those stats for Lynchburg, VA. Population is off an order of magnitude. Physical size too. 2009 census has Lynchburg at 73,000 people and a size of 129 km^2. You say it’s “off”, but you may just be using different definitions of city boundaries. Maybe she used an outdated definition? She needs to clarify her methods. Presumably there’s a paper somewhere? “Remote sensing of the urban heat island effect across biomes in the continental USA”, Imhoff et al. 2010 ? Yep, that’s it. Fig 9 is what I’ve been after for years. Fig 9: As forested cities grow beyond the 10-50 km2 threshold there is a sudden leap in UHI from 2 to 10°C. Sorta like what happened in the 20th c.
McKitrick’s next analysis could make use of these explicit adjustment factors (even though this is a US-only study, and not every country has the same level of AC-generated waste heat). The fraction attributable to UHI/landuse may exceed McKitrick’s 1/3 estimate. I likely have this screwed up, but if it was the winters that were warming, there’s something to the A/C issue since buildings with a lot of people in them tend to be air conditioned year around. That would add rejected heat that wasn’t there before the bigger buildings. “must be”? Strong words. If both area and population are “off”, and in the same direction, that may be telling you something. Is Philadelphia “off” by your sources? Buffalo? The answer to your question seems to be contained in my reply to Hu. They cookie-cut the urban areas of analysis, making “cities” smaller by eliminating areas mich higher or lower than average. Probably they report population numbers and sizes for the homogeneous UIs – NOT for “cities” per se. Aside from the effect of UHI on climate indices, the UHI quantum is interesting both from the point of view of impacts and adaptation. People seem to have adapted to the higher temperatures associated with cities. If UHI is of the size indicated here and people have somehow managed to adapt to urban environments, this would seem to cut down on the number of potentially worrying impacts. Maybe there’s some “lowhanging” mitigation fruit here as well. One can always make the point that the problem of global warming is not one of direct temperature hazard against human beings, but against the ecossystem as a whole, glaciers with their fresh waters, animals, vegetation, etc. Cool, I can play the Team here. It looks like it could be Lynchburg, VA. The city lies to one side of a river and you can see where the river is in the picture. I think that it could be a typo, and the number should be 70,000. I’ll go so far as to say that it is Lynchburg, VA. Pull up a map and you can pretty much trace the heat areas along major roads and populated areas. McKitrick’s 1/3 applies globally. It is possible that the magnitude of the effect at Siberia is much larger than that. Bender, that “1/3” comment is terse, even by your standards :-). I’m interested in UHI, so a little more explanation would be welcome. Search McKitrick’s name in the previous thread. Look at his Table 6. Yes, I too like to see a lot of science here–it’s what, IMO, truly makes this site vigorous, stimulating (even if I don’t always understand it all). These numbers look a little large to me. Anyone can do a crude guesstimate of UHI by driving in and out of cities, and a number of posters at WUWT have done so, not particularly rigorously but enough to get an idea of the order of magnitude. For a while I was driving in and out of London at night on a regular basis, and the UHI was about 3-4C, so I am amazed that Jones can say it is 1C. Even in Norwich where he works, population 136,000, UHI will be more than 1C, although we have little truly rural land in SE England, so I could be understating things. MODIS being satellite based does not necessarily proxy ground surface temperature. Need to read the paper. The numbers look very large to me also. I guess one should be initially sceptical about surprising results either way. Is this actually a paper? says it is a feature. If the paper isn’t already out, I don’t think for most journals they can publish post this disclosure. Feature and Zhangs presentation are pretty weak on describing the methodology for deriving temperature, calibration etc. The results are so extreme though, that its unlikely to be a ‘minor’ calibration oversight. 4C is as about as large a UHI as I’ve heard from ad-hoc, driving in and out of city experiments. 12C is of the scale! The difference of the skin appears to be that large for mid-day summer: 36° vs 27°C for eastern forested cities (Fig 3). You can’t drive the skin the way a satellite can. Is this estimate biased? Maybe. Is the bias equal to 100% of the true difference? Hard to imagine, but worth a look. Also remember that with satellite data they get to census all of the very hottest and very coldest places around the city. This is going to amplify the ends of the spectrum compared to a semi-random transect along a paved vector. I could see that maybe doubling the expected magnitude of difference. I don’t have a way to quantify it, but the major rural roads show as much hotter than the countryside. Best guess for Providence is ~30c vs~22C. This is about right to explain most of the difference between what people have seen from traveling along a road and what is being seen here. This study uses city area, which they argue provides a more consistent estimate and can be derived from satellite data. No depending on census data which has problems of homogeneity. I remember Spencers post at WUWT, at the time I thought the technique he used was rather ‘unique’; From memory, dividing population densitys into ‘buckets’ and using a temperature avg within those buckets to produce some very regular(visually pleasing) graphs from some quite irregular data. I wasn’t entirely convinced that this was not more a result of the method than any inherent property of the underlying data. Nevertheless, with Providence’s population density around 4000p/Km2, Spencers results anticipate a UHI of ~2C. not 12C. The differences in methods are large. The Imhoff analysis more robust & comprehensive. Good to understand actual reasons for the difference, but no reason to think they must be incompatible. I’m just astounded by the 12C figure (as you might have guessed). I’m not in a position to say it’s right or wrong, or incompatible with any other finding, just never heard a UHI of that magnitude suggested before. Whats Imhoff analysis got to do with it anyway? Apologies, spotted the “Imhoff et al” reference above -I’ll have a quick look now. It’s the peer-reviewed source upon which the Zhang presetntation relies upon wihch WUWT article relies. Careful… doesn’t that have a lot to do with how we got into this mess to start with? From what I have seen, too many “Climate Scientists” thought that as long as their methods came up with the expected results, they MUST be correct. At least in engineering you had better be as skeptical of expected results as the unexpected ones. The NASA article notes that UHI is not a newly discovered phenomena – that weather watchers have known for two centuries that cities were warmer than the surrounding rural areas. But Jones’ China study “proved” no UHI. Here is a UHI study of Barrow Alaska along the Chukchi Sea, population 4600. Winter average UHI of 2.2C increasing to 3.2C under calm conditions. No significant UHI during summer. Interesting, the authors are making a case for UHI by anthropogenic (Domestic) heating rather than more conventionally argued urban development; tarmac, concrete etc. That might be a characteristic of small Alaskan towns. Small implies less pavement, and Alaskan implies more domestic heating. I bet you get very different results for Mexico City. There are 46 paved airports in Alaska. Worth noting that the Imhoff et al 2010 study covers continental US, where you probably get more waste heat in summer than winter (due to AC). North of ~49 might yield the opposite result. Humans expending energy trying to avoid both cold (when & where it’s cold) and hot (when & where it’s hot). Bender: I’m wondering whether UHI effects increase dramatically or even exponentially in extreme cold and extreme heat. Does that make sense? It makes sense in that the more extreme the climate the greater the energy you must expend to make it tolerable. But just because it makes sense doesn’t make it true. The biggest cities aren’t in the hottest or coldest places. It’s the temperate regions with fast-growing cities & suburbs that swallowed up quality rural weather stations that would be the largest source of trend error. And it may not be population growth that is the driver, but the trappings asscoiated with automobile travel: highways & parking lots. If true, this might annul that argument that for cities that were populous by 1920-1950 the 1970-2000 warming trend must be due to non-UHI effects. If greenspace is being in-filled with asphalt throughout the post-war boom years, this is the perfect candidate for strong modern UHI effects in pre-existing population centres. This would also be consistent with Ross’s use of economic variables around the globe. Industrial storage and trucking are relatively modern trends (e.g. completion of interstate highway system). No economy: no need for trucking & large-scale storage. The invention of the container. I dunno. Building developments in suburbs with asphalt streets and a row of asphalt roofs on each side would be where the population influence would come in. Just extrapolating (always dangerous) from skin temperature observations in Philly. The strongest effects per capita are very likely rural rather than urban. Rural stations are usually – at least here in California – in small towns along rail lines. At least historically that is how those towns came to be. The region around many of those town is now extensively altered through agriculture. Regions that were grazing land or winter wheat as late as the 1950s are now vineyards, orchards, and rice paddies – all extensively irrigated. The northern and southern ends of the Central Valley tend to be the least affected by agriculture, but both ends have seen extensive development in the last 30-40 years. I think Hansen has his adjustment signs inverted. This resonates for me. 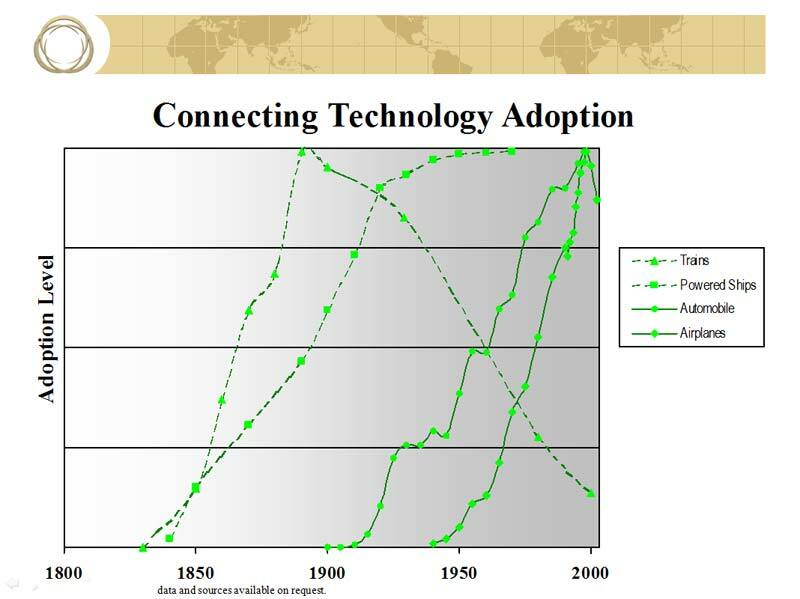 Brings to recall some research I did a while back on various “connecting technologies.” Here is a chart of global adoption of transportation technology. Most of these kinds of things are a bit surprising to many — we tend to assume new inventions of the past immediately spread everywhere. Instead, they grew over time. More recent technologies have been adopted far more quickly. As you can see, cars/trucks were a mid-late 20th century phenomenon as far as global adoption… yes, coincident with “planting” all those roads and highways. That would make sense. The human expenditure of energy is usually played down though, in favour of a ‘change of land use’ argument – absorption and retention of heat. So interesting to see a counter example. No UHI in summer, 2-3C in winter from heating. Correct me if I am wrong, but I am not sure that you get more waste heat “due to AC”. Concerning human demands for comfort, the only additional energy (eventually heat) going into the system (the urban area in this case)from outside is the energy required to run the AC compressors. That amount of energy is a fraction of the total energy expelled by the condenser. Reminds me of the puzzler put forth to engineering students concerning somewhat the same issue. What happens when you put a refrigerator in a closed room and turn it on with the refrigerator door open? Will the room temperature increase, decrease, or stay the same? The temperature will increase because the energy required to run the compressor results in heat. Energy demands are higher in the southern US in summer than winter is the point. And I’m not married to it. If you have data to the contrary, why not show it. The refrigerator in the room is a closed system. In a closed system the cooling of the refrigerator equals the rejection of heat from the evaporator. Power loss through running the compressor is turned into heat. An AC system is an open system. Bender is correct that AC systems rejecting heat is a large addition to the overall heat flux. People with AC do not keep the doors and windows open during the heat of the day. as I see it the only additional heat from AC in the urban area, or any area for that matter, is from the energy required to run the compressors. The energy rejected from the condenser (outside) includes the energy from inside the building and from the compressor operation. As I see it the energy from inside the building has just been moved from inside to outside the building and is not additional energy from outside the system. More energy is moving into a smaller mass of air. That is, the heat that would have gone into the volume contained by the building is shunted to the outside. In an urban area, most of the volume at low levels is inside buildings. And as the urban density increase, the inside volume increases. I think that this shows that models must be more the back of the envelope lunch line napkin models. According to this model, teh effective albedo of air conditioned cities would be lowered. Does anyone think that this model has any utility or credibility? For the US, at least, one should also consider the rise of all electric housing in the southern states. All electric houses use heat pumps with supplemental resistance heat in the winter. Where winter month hourly temperatures are mostly above 45F/7C, heat pump systems are efficient and work very well. Also forgotten is the 50W radiated by each human’s basal metabolic rate, plus the heat of condensation of the water in each breath when cold enough 🙂 . Hm, does anyone know how much heat is radiated by each kind of bird and mammal? Well, some claim knowledge of bovine emissions from the “other” end, perhaps those data would help. Worth noting that the Imhoff et al 2010 study covers continental US, where you probably get more waste heat in summer than winter (due to AC). Using degree-days as a proxy for heating/cooling energy use, it would seem that heating would produce significantly more waste heat then would cooling. And how that balance play out from South to North, winter versus summer – that was the question. Re: bender (Dec 16 13:52), Where I live, bender, anecdotal evidence suggest that peak load anomalies are highest during local high temperature + low humidity anomalies in the summer versus local low temperature + low humidity anomalies in the winter for electricity. Residential natural gas usage is opposite. Industrial usage tends to be less variable around the local baseline. I don’t know how that plays out as one moves further away from the equator. I do know that the local weather is most variable day to day in the winter and spring and less variable in the summer and fall before the onset of the late fall rainy season. Barring tropical systems, the bulk of the rainfall occurs from November through May. The driest months rainfall-wise are August to October, with October being the driest on average. Selecting from the drop down box “1. U.S. Energy Markets Summary” for the years 2001 to 2010 monthly starting in January ending in December. Here is monthly energy consumption for the U.S. using monthly averages from 2001 to 2010. It includes all energy use including motor vehicle fuels. The first column following the month is in Quadrillion Btu and the second column is percentage of the total for the entire year. One interesting corollary would be that the tree rings that stubbornly refuse to show significant warming in the last 40 years could be right, after all. Speaking of Anthony (wuwt)Watts: very relevant recent post, Measure UHI in your town with this easy to use temperature. A perfect extension to SurfaceStations. I remember my BBC weatherman the other night saying that overnight temps would be -1 in my city “but in surrounding rural areas that would dip to around -4”. Do meteorologists take UHI for granted? As a Broadcast Meteorologist, we often (almost always) dictate a difference in temperature from the cities to the surrounding towns (colder at night in the towns, but warmer or colder during the afternoon depending). I think one of the arguments you’ll see here from climate scientists is that it’s the ‘trend’ that’s more important, not the actual degrees. Meaning, even if the UHI is +38 or something, it doesn’t mean anything for the data if that same value has remained constant over the last generation (or, as Jones et al say, vary by only 0.05 or something). So, if the anomalies themselves change over time (which I think some here are studying), then you have something that needs to be addressed. However, if the UHI is not clearly separable from the data, but instead contaminates it in unclear ways, it seems like the UHI effect could contribute to a false measure of warming. As you carefully point out, it is the trend that is the key issue, and you have to be comparing apples to apples and not to some unknown mixture of apples and oranges. bender, it seems important to point out how much growth many 2nd and 3rd world cities have experienced in the last three decades (not to mention 1st world cities). In 2005, it took 8 million inhabitants to make the top 26. Of those 26, 21 would have been considered 2rd or 3rd world countries in 1950. [Geography.About.com] Three were U.S. cities, plus London and Paris – those are the only 1950 “first world” cities to make the top 26. As of now, it takes 8 million to make the top 38. And only 210 years ago only ONE city had ONE million! The degree of urbanization has been much more pronounced outside our back yard. With this study the UHI warming of the rest of the world can be seen much clearer. YES, measured temps are higher globally. With the world population having gone up 2.5-fold since 1950, and the great majority of that increase is in the 2nd and 3rd world countries who are trying to catch up to the U.S. and Europe. And that effort meant people moving to the cities – a trend which began just about the time the LIA was ending and the Industrial Revolution began, when the world population was 1-1.2 billion [About.com], vs today’s 6.5 billion. A weather station on the edge of a growing city, properly sited, will obviously indicate a warming due to UHI as that city expands around it. How does one factor such things as that into any “trends” in data? Even a station sited in the heart of a city could reflect a real UHI effect in the trend caused by changes in the city over time. This mess is a mess, to go along with SM’s justified emphasis on the quality of alleged temperature proxies–another mess. There are ways to deal with such inhomogeneties. There are right ways, and there are wrong ways. But as long you don’t disclose what you are doing (Phil), there’s no way to judge. THAT is the mess here. Not UHI, but what the gatekeepers do or don’t do about it. You’re absolutely correct. With the UHI gradient as steep as it is, misplacement of a met site by 1/4 mile can cause a big error for that city, possibly as big as the 0.7C global rise since 1900. And as the city grows that location’s relative value vs the city’s max UHI will also change. bender has it right, that CRU didn’t have it right. From the Climategate files, it was apparent they just averaged globally. That is not acceptable, even without this new information. Every city is unique. Averaging is lazy science. Interpolating and adjusting for the time element – these are critical. Zhang’s study doesn’t support that the temperature would necessarily go up as urban sprawl overtakes a temperature station. With desert areas, the tendency is for cooler readings in the urban areas. This seems likely to be due to watering landscaping, with the resulting evaporative cooling. Does it show the temperature going down? Is there a decrease in UHI? It may be that population isn’t the best metric. Or, perhaps there’s a limit to how much UHI you can create on population alone. Perhaps Jones used Beijing for his calculations, and came up with the idea that UHI only changed (trend-wise) by 0.05 degrees from 1900 to 2000 (given the city was > 1,000,000 people the whole time. People leave, the crumbling infrastructure stays. The Imhoff study did not use “populstion” sas a depednent variable. And nether did McKitrick & Nieremberg. Details, details. Bottom line: at least 1/3 of AGW signal is UHI. Maybe more in continental US, but what’s a fraction of a fraction amongst friends? This analysis of the NCDC data shows that the raw rural trend for the 20th century in the US 48 was 0.11 deg C, while the adjusted trend for both the rural and urban stations was 0.69 deg C. If the methodology of the paper is correct, this looks to me as the UHI was responsible for possibly 80% of the reported “warming”. The difference between the UHI in forested, grassy and desert surroundings would point to the predominance of evaporation suppression under sunlight as a key source of the UHI effect (out of the polar regions at least). I’ve never seen a systematic analysis of humidity in any UHI studies – has anyone else? Can anyone identify the specific features of urban core Philadelphia responsible for the three hot blobs? Large asphalt surfaces? Parking lots and industrial storage? That might explain why you get lower variance when you drive a transect. You’re tracing a warm vein. To maximize variance you need to cut the vein. If you pull up Philly on Google Earth and try to overlay the graphs (can’t do that directly) it looks like the three bright areas are just dense housing areas. Zoom out to about 10 mi and you can see the “density” of the housing in the areas. The southernmost area seems to be just north of the stadium complex area, which is very dense (and old?) housing. The northernmost area looks to be just north of Petty Island and has the same dense housing. The westernmost area seems to be centered around S 57th St. Again, old houses packed tightly together. Old houses of frame construction, speaking as an owner of one, may very well be entirely uninsulated. Alternatively, a previous owner may have gotten the itch to try and fix things and this can range from crumpled news papers stuffed into the spaces between studs – I’ve found papers dating to World War I in stud spaces in old structures – to blown-in insulation, typically mulched paper. Anyway, the point here is that in areas of older buildings, especially poorer neighborhoods, the signature from winter heating should be very pronounced compared to more recently built neighborhoods. I grew up near Philadelphia. As I compare the hot spots to a map, I’m surprised. The central high-rise district is in between the three hot spots. The biggest hot spot is in South Philly (as they say) and it seems to be centered on the sports complex there, which has 4 stadiums and acres and acres of parking lots. This is right by the approach to the Walt Whitman bridge across the Delaware and the crossing of I-95 and I-76. I’m less sure of the other two. I believe the upper right hot spot in the picture is focused on an industrial area in North Philly. The upper left one looks to be in West Philly, maybe with its eastern end around the Penn campus. But it’s centered on an area that I wouldn’t consider particularly warm. Yes, expanses of bare asphalt. I don’t think your assessment on the South Philly hot spot is correct. I used to live in Center City and was quite familiar with South Philly. If you look carefully at the red hot spot, you can see a small mark just below the spot. This mark represents the large lake in FDR Park just to the west of the stadium area. The southern boundary of the hot spot is therefore the Schuylkill Expressway, more or less the southern boundary of the South Philly we know and love. The heart of the hot spot is indeed is residential and is the highest population density area of South Philly. Maybe all the Italian mothers on Ritner Street were cooking at the same time! If population centres are more likely to have large expanses of asphalt (sports complexes, shopping malls, industrial storage, highways, etc. ), this may be the big culprit, not waste heat associated with creature comforts. Now it’s clear why the temperature differences are on the order of 10°C. You’re not measuring well-mixed air temperature. You’re measuring skin temperature within the boundary layer. Asphalt versus forest. How this differential relates exactly to trends at a formerly rural surface station is anyone’s guess. Compared to skin temperatures in the umixed boundary layer, waste heat is very well-mixed. Agree with this also. I looked at the imaging for Baltimore, in particular, a hot spot in the lower left corner – Troy hill drive. Using google maps, this appears to be a warehouse/manufacturing complex – there’s a Harley plant there ;). I counted 80 A/C units on just one of the buildings there. Guessing about 1,000 units altogether in a relatively small area. There is no temperature scale given for the images, but if these hot spots are ~+10C, then I think the headline figures are just a result of photographing A/C units from a long way away, rather than a well mixed air UHI as you suggest. 1. With UHI spikes even half what Hu finds, it is very important then to identify where in the pixels the met stations are, then to allow for that unique juxtaposition when including in any regional or global averaging. 2. The inclusion of air-conditioning in the study was good. I’ve long wondered when someone would include it. It intuitively seemed to be some portion of the UHI, though I had no idea how big or small. Hu shows it to be more than the entire UHI Chinese study Jones signed on to, while being a minor player. This is a step forward. So now, like in artillery targeting, we have lobbed one in short and one in long, and now the effort can be taken to interpolate some intermediate values. The 0.05C was just ridiculous. The 12.2C may, on reflection, seem equally troubling. Even 5C or 6C would throw all the CRU and GCM numbers all to hell. For that matter, 2C or 3C might even do that. I too was very interested by this study. I took the photos and compared them mathematically. We can’t improve too much on that. Using Visible and Built-Up as the predictand variables we can increase the correlation to 0.8. Adding vegetation to the mix doesn’t help much. So … it appears that while the vegetation information is good, the visible information and the information on the built-up areas is sufficient, and better than any other pair. Willis, what is your “visible” variable measuring? Bender, sorry for the lack of clarity. There were four photos given in the study of Buffalo, NY. One was IR temp, one was vegetation, one was built-up areas, and one was a standard photograph in visible light. The correlations are between the four photos. 49 stations in East Australia were part of the study ‘Assessment of urbanization effects in time series of surface air temperatures over land’ Nature v 347 13 Sept 1990 by P D Jones, P Ya Groisman, M Coughlan, N Plummer, W-C Wang & T R Karl. Coughland and Plummer are from Australia, as am I. Of the 49 stations chosen for study in the ‘Letter to Nature’ over the period 1930 to 1998, I have visited all but Cooktown and about 5 of the Lighthouse Island sites, though the mainland nearby to some islands aids understanding. I have seen the towns intermittently from about 1950 when I was old enough to observe and remember, to a visit this year to Cape Otway Lighthouse. I will try to show how context helps. It is absolutely misleading to represent these towns as the paper indicated, as “rural or small village sites.” The paper gives the largest population as 33,368, which is now known to be ample for UHI to show itself. In 1990 few Australians would term that a “village”. In the study period, there was a national census count in the years 1933, 1949, 1945, 1947, 1954, 1961, 1966, 1971, 1976, 1981 and 1986. Therefore, there was no shortage of population statistics. However, the population statistics are meaningless unless they are coupled with positional information relating the temperature measurement site to the weight of the population. Armidale, NSW, BOM 56002, was a town with a City Council population of just on 15,000 in 1967. However, the BOM number refers to the AM Radio station 2AD site that was established in North Armidale about 1947. BOM records for this station, as sold to the public, start in 1957, but there was a weather station in Armidale city since 1857. The records the Nature paper (start date of 1930) therefore have uncertain origins. There are 4 Armidale weather sites described in http://www-personal.une.edu.au/~pburr/weather/history.htm The 2010 population of Armidale city is about 20,000 depending on definitions. One might therefore conclude that a UHI effect, if found, would be compounded only a little by population change, but more by energy use per person; and that a reconstruction would be difficult because of changes in station location. (It’s easy for me to get Armidale information from my resident brother-in-law who has a PhD and an AOM civil honours award). A linear fit from 1957 to 1992 gives a slope of y (temp) = 2E-05x + C. That is, about dead level. Bundaberg, Queensland, where my father was born, has BOM number 39015, the Post Office. My Dad remembered Bert Hinkler, pioneer aviator and also born in Bundaberg, landing there about 1930. Hinkler died in 1933. The BOM records a weather station from 1942, but tends to delete records before 1959, number 39128. The Post Office site started records in 1885, but the BOM tends to use dates after 1965. Like Armidale, the 1930-1960 records used by Coughlan and Plummer now seem to be unacceptable for public use as decreed by the BOM. Bundaberg has a present population of about 50,000. The airport is about 5 km from the PO and is now almost surrounded by suburbs. In my recollection, the population of Bundaberg did not change greatly from 1930 to 1988. The growth was more in outlying agricultural towns up to 100 km away. Linear slope from 1892 to 1992 is y = -5E-06x +C. Also dead level. One could take each location of the 49 and make comment, but one won’t. Taken overall, probably half of the 49 stations from Nature were showing measurable UHI from 1930 to 1988. Some started from low beginnings, others were already infected and would have stayed roughly constant. The truly rural location, like Gabo Island lighthouse, illustrates a common outcome. It asks the question, before we look at UHI, should we not look at Global Warming? One should place no reliance on the paper cited. Events have overtaken its prior careless conclusions. My home city of Melbourne, Australia, population about 3 million, has UHI transects from the University of Melbourne. From the first paper, comparing the surface based measurement of CBD and IS areas. So its possible the numbers reported in the Zhang presentation should be read as short term ‘extremes’ rather than long term offsets. Am I wrong to think it was produced specifically to solve the UHI issue for the IPCC? The metadata needed to address this problem is finally being applied. do in this area. Expect some other interesting results. Also, I’ve found a neglected satillite product that goes to the heart of the issue. ARRG. its still on film. Hoping that *unnammed* will do something with it, cause I dont do image processing. OK, where’s your blog? Can do at least some initial image processing to prove out feasibility of whatever you are thinking about. Just did a (trivial) mini job for RMcK. Whoever said “similarly-sized but spread-out Buffalo, N.Y.” should have clarified how two cities can be of similar size but one is spread-out. Perhaps they meant similarly-populated, but that’s not what they said. Curious thought, have any studies been done on various types of power generation in regards to city size and UHI? I don’t mean just the power stations either. Each type could point to a different cause for UHI. Also, I know water itself would not be enough to cause such a UHI effect, but the amounts of water needed in a city that usually exits through sewers under the asphalt would seem an interesting avenue to look at as well. Is there a change in humidity from such sewer systems inside the city as opposed to outside of it? Detailed explanation of the data will probably be somewhat complicated. There have been a lot of possible factors mentioned – AC use, heating in winter, irrigation, landscape water use, thickened boundary layer due tall buildings, solar radiation reflectance differences between natural and man-made features, etc. There is still another level to some of this. Some AC (hot, dry areas) is actually swamp coolers, which would be expected to lower the air temperature (and therefore surface temperature). Plant coverage is important, but the water evaporation (and associated evaporative cooling) in hot weather is very very dependent on the plant species. Just looking at grasses, buffalo grass requires no water during the summer, while a more conventional bermuda grass lawn in Dallas during a hot and dry spell may require 20,000 gallons a month. Droughts also have the property that, in the wild areas, they kill off plants which have high evaporation rates, decreasing the evaporative cooling effects in subsequent years. On the other hand, plants in the cold northeast tend to have high evaporation rates for a given temperature, since at lower temperatures, the leaf structures of warm climate plants don’t evaporate enough water to move sufficient sap to keep the tree alive. The trees found in the northeast generally provide more evaporative cooling during the summer than the drought tolerant trees found in much of the southwest. And just to make things more complicated, there is the question of snow cover, which may be thought of as a being driven by climate, but is a also driven by weather in a very real way. Then how much does snow removal contribute to all this? And what about chages in attic insulation over the years, causing white snow to remain on a black roof longer? 98.6 F and growing up on the farm we had 20 milk cows in a barn that was 30foot wide by 60 foot long it had no insulation in the dead of the winter at -10f we had to run a fan to remove the exess heat from the building or it got up to nearly 100F inside you put 20 people in a room together they grenerate huge amount of heat now put 200,000 people in one place how much heat will they generate? in conclusion a study that would be interesting and relivent would be that of city imports such as foods that people and pets eat and turn into calories which in turn become heat and fuels that are burned becoming heat and also electric energy consumption. and these compared to the UHI to see if they have any direct coralation.